This mobile unit acts as an art island where four or more can work. There's lots of storage between the easels and on the shelves. 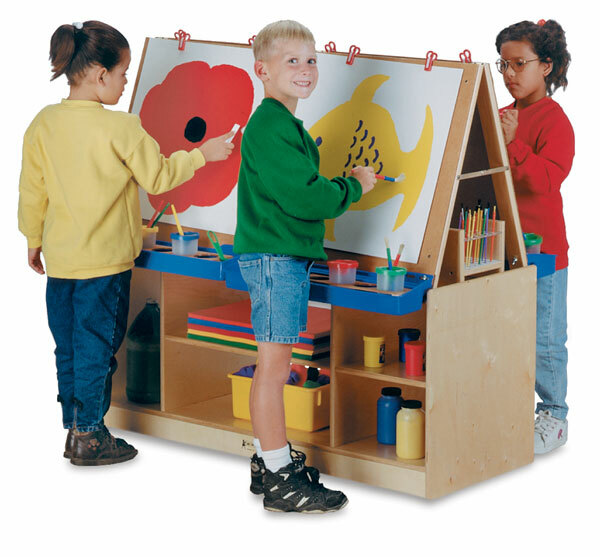 The art center features durable, stain-resistant KYDZTuff finish and hardboard easel panels. It even includes clips and paint trays. Optional acrylic, chalkboard, and dry erase easel panels are available separately. Need to move it occasionally? No problem — it's mounted on casters just for that reason. The removable tabletop easels mount securely to the base. Base is 22½" H × 49½" W × 20" D. Overall height is 45". Assembly is required. Lifetime warranty. ® Jonti-Craft is a registered trademark.™ KYDZTuff is a trademark.